I don’t often dig out old posts out of the archives… But I think this one deserves another airing. If like me you’re already drowning under tinsel, star-shaped cookies and costumes for the Christmas show, you might find this helps restore some of the wonder! This is the TARDIS. It’s from the long running UK TV show Dr Who and it’s a time-travelling spaceship. It’s become something of an iconic image and because of the unmissably excellent Christmas Day special episodes, it doesn’t seem entirely out of place in the jumble of jolly santas, cherubic angels and sprigs of holly. Apart from that, all you need to know is this: It’s bigger on the inside. On the outside it’s the size and shape of a 1960’s British Police telephone box (a regular sight on UK streets when this series started, ten years before I was born! ), but on the inside it is apparently vast (there are even rumours of a swimming pool.) 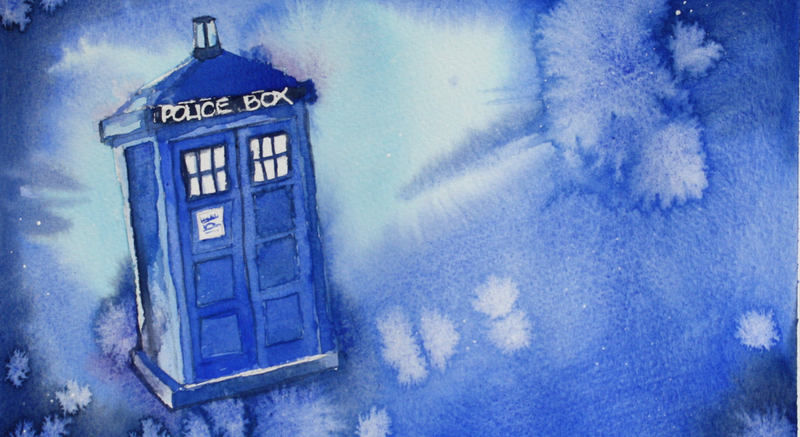 Ask any Dr Who fan to describe the TARDIS and that’s what they’ll tell you – ‘it’s bigger on the inside’. Think of how you would gasp in awe and wonder if you were to walk through that little blue door and discover that it is so much more than it appears to be. Think of how you would run outside again to check and double check what you were seeing. Think of how much your mind would be expanded! A new-born baby. Small, soft-skinned and helpless. Wrapped in a cloth and lying in a straw-filled manger. Our God who spoke the universe into the existence and holds every part of it together; our God who said “let there be light” and who is the light; our God who is infinitely powerful, infinitely wise, infinitely creative, infinitely loving, infinitely big; everything that he is is somehow contained inside that tiny cloth-wrapped package in the manger… Astounding. Take a moment today to let that sink in again. He’s so much more than he appears to be. Seriously bigger on the inside. it doesn’t have a name, as far as I know it doesn’t even exist and I can’t imagine it would be useful, but Jesus often doesn’t follow my rules and I always eventually realise it is easier just to go with what I think he’s showing me! So this is it: A two-chamber bauble-bottle that holds more one type of liquid. Christmas is just like this.. Christmas is a container that holds more than one thing.. I really love it. I love the kids’ excitement, the preparations, the sense of specialness, the time with friends, the family traditions, the special food, the random animals in nativity plays and even the theologically-challenged carols. I just love it. Yesterday was my Dad’s birthday, and this will be our sixth Christmas without him. And at this time of year, I miss him more than ever. I can’t enjoy our traditional family singsong without missing the sound of his voice, I can’t watch my kids in a recital without thinking how proud he would have been of them, and I just can’t do Christmas day without missing his energy and sense of fun. And I’m guessing for many, if not most of you it’s the same. Along with the joy comes an acute awareness of what has been lost. Christmas is a container that holds both joy and sadness, and somehow they can only be poured out together. It seems to me, at this time of year, that the world is conspiring to show me a perfect Christmas. One with perfect, complete families where no-one gets sick, or forgets anything, or worries about money or falls out over the rules of a board game. Where teenagers leap with joy at the idea of a game of charades, the roast dinner is all warm at the same time, the whole family gather around the piano to sing carols (in four-part harmony) and above all, no-one feels sad, not even for a moment. It’s not true of course, there is no ‘perfect’ Christmas. It’s just another impossible standard for me to fail to reach. Not everything has to be perfect anyway, and I suspect that the fact that the joy always comes mixed in with sadness just makes me normal. For those of you who are similarly normal: Know that God understands. He understands great joy and deep sadness. And he reaches out to carry you through both. and enough hope to look up into the eyes of the Saviour of the World and to find yourself covered by his love.